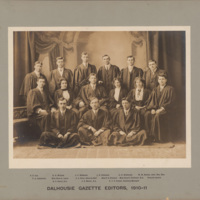 The Dalhousie Gazette was established in 1868, making it the oldest continuously published campus newspaper in Canada (the University of New Brunswick’s newspaper, The Brunswickan, predates the Gazette by a year but was originally printed in magazine format). 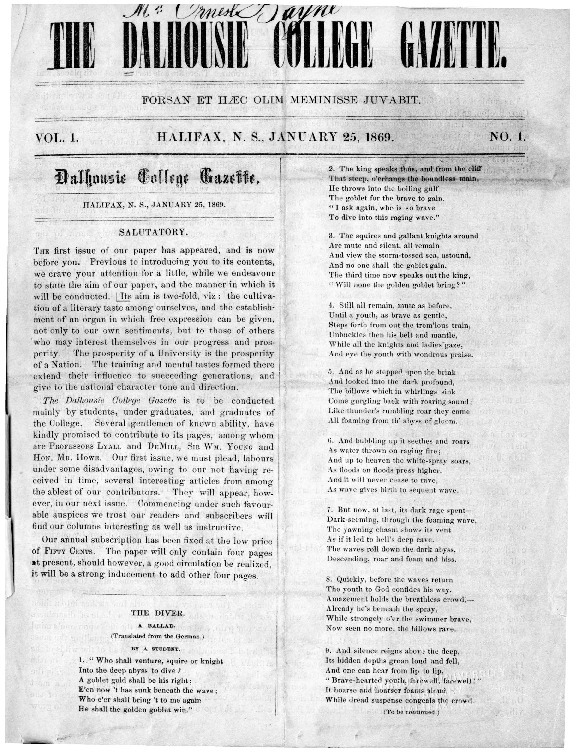 The first issue was published on January 25, 1869 as The Dalhousie College Gazette. It was produced by John J. Cameron, A. P. Seeton, and W. E. Roscoe of Dalhousie College. 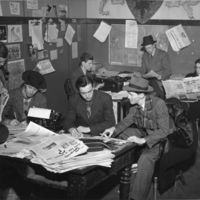 A yearly subscription to the paper was fifty cents, or five cents for a single copy. 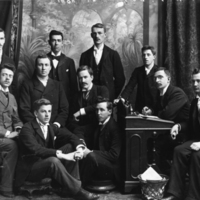 The students of Dalhousie were granted ownership of the Gazette on November 10, 1869, allowing the Dalhousie University Students’ Council to elect editors and manage all financial issues. In 1957, the Gazette was awarded the Neil MacNeil trophy for the best college publication in the Maritimes. 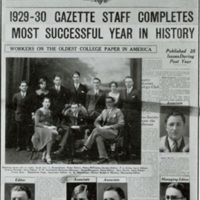 The Gazette is still active, and produces two issues per month as of 2017. Run by the Dalhousie Gazette Publication Society, its aims are to report objectively on current events at Dalhousie and the larger Atlantic Canadian community, provide an open forum for free expression and meaningful debate, and provide mentorship to young writers. The Gazette is financed through student fees (including those from the University of King’s College), and all students are eligible to vote at meetings. Digitized versions of the Gazette from volume 1 (1869) to volume 145 (2013) are available on DalSpace. The first page of the first issue of the Gazette includes the Dalhousie motto: Forsan et haec olim meminisse juvabit (Perhaps the time may come when these difficulties will be sweet to remember). This motto was changed to Ora et Labora (Pray and Work) in 1870 to match the University's motto.